The city of Dayton, Ohio, joined the International Hockey League in the 1964-65 season as an expansion franchise. The team was run by Lefty McFadden, who was general manager of Dayton Speedway then. A "Name the Team" contest was held and "Dayton Gems" was the winning vote, a nod to the city's "Gem City" nickname. The Gems were a very popular and successful franchise for most of their 16-year history. By Year Two, they were in the Turner Cup Finals, but came up short against Port Huron. After the 1967-68 season, original coach Warren Back resigned and was replaced by former Red Wing Larry Wilson. Wilson inherited a team on the verge of greatness. They had won the Huber Trophy as regular season champions two years ago (44-25-3). They would do the same in 1968-69, topping the IHL with a strong 40-21-11 mark. They need every one of their 91 points, as they finished ahead of Toledo by one point. Dayton hockey fans responded to their Gems, averaging 4,500 per game at Hara Arena. The Gems boasted the second-strongest offense in the league, pumping in 313 goals. They were led by right winger Don Westbrooke's 59 goals and a league-best 118 points. Six other Gems scored at least twenty goals, including Dunc Rousseau with 35. Player-Coach Wilson chipped in 61 points in 50 games. On defense, the Gems had no equal. They allowed a miniscule 227 goals, 8 fewer than second-best Toledo. John Adams and Pat Rupp played about the same games that year, with Rupp playing 41 games and Adams getting the nod in 32. Adams played in 6 of the 9 postseason games. The IHL used an unusual round robin format for the first round of the playoffs that season. Six teams qualified for a best-of-three tournament. Columbus and Port Huron were eliminated, and Dayton faced Fort Wayne in Round Two. The Gems blew away the Komets in the best-of three series, outscoring them 14-4 in the series. They would then face the Muskegon Mohawks in the Turner Cup Finals, another best-of-three affair. The Gems swept aside the Mohawks in three straight to win their first Turner Cup title with a record nine straight playoff victories. The cover illustration was done by Cincinnati Enquirer cartoonist Jerry Dowling. Several of the Gems programs I have have Dowling drawings. 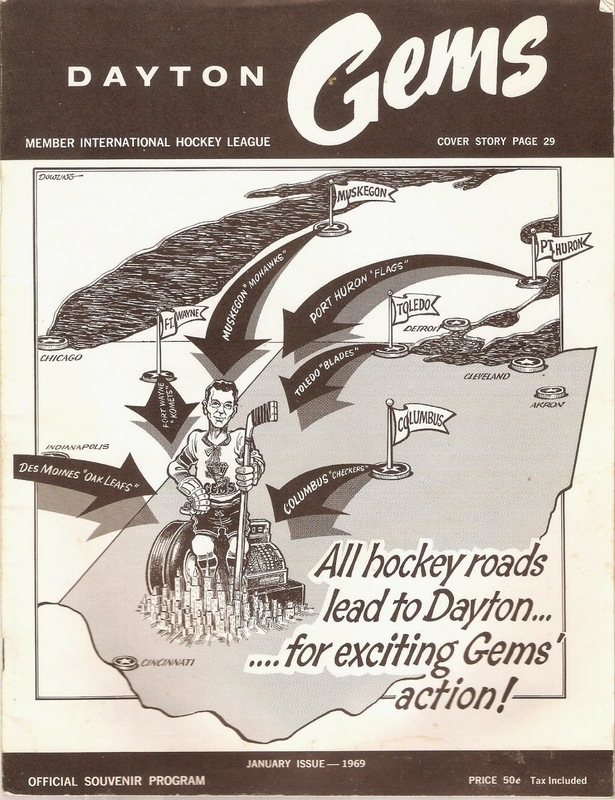 I like this drawing, and considering the season the Gems were having that year, all hockey roads really did lead to Dayton in 1968-69. This program is 35 pages long, with black-and-white pictures and advertisements. Local ads include a variety of businesses, from The Keyhole Lounge, Miami Maid Better Bread and Blatz Beer. There are also articles about each IHL franchise and a picture of their arenas. I'm pretty sure McMorran Arena in Port Huron hasn't changed a bit since it's picture was taken for this program! Unfortunately, the previous owner clipped something out of one of the pages (a coupon, maybe? ).